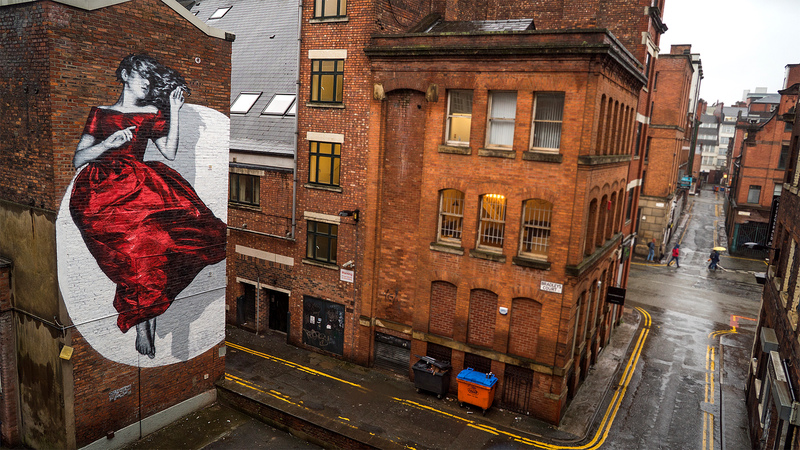 In the shadow of Stevenson Square in Manchester, in the northern quarter in Little Lever Street , where over 100 years ago, the Suffragettes once gathered defiant , Cities of Hope is proud to reveal the first of our Tributes to Hope. This tribute is in gratitude to all women that stand against injustice. A recognition of their strength, resolve and dignity, A testimony to what they have endured and still endure, to make the world a better place, for all of us. We honour you, we witness your courage and are humbled by your sacrifice. Serenity is the production of the female and male partnership that is SNIK. A representation of this struggle for equality, as she moves on from the hardships, troubles and pain of the past, to a new future made possible only through the selfless deed of those that have come before, those that are amongst us now and those that are yet to come. Serenity moves up, down or to the sides. She moves in to the past and beyond to the future. Her purpose, to inspire those who refuse to lose hope, who continue to believe. Where there is inequality, so also is Serenity. A reminder to all of us, that we do not stand alone, we have never stood alone.